We are blessed in the north with four seasons and that makes the choice of when to do your engagement photos a little bit more difficult. You can do summer winter spring or fall and every so often we get a mini season within winter where the water freezes over. During this particular shoot though it was very cold the lake had frozen over and shifted pushing the ice up into sheets and presses it up into the air. This unique happening in nature gives all new opportunities for pictures. In this photo we have used the ice as a foreground element which is slightly out of focus so as to bring your attention to the bride and groom. We happened to do this on a sunny day so we have blue sky and the sun is being used as a rim light and a back light. 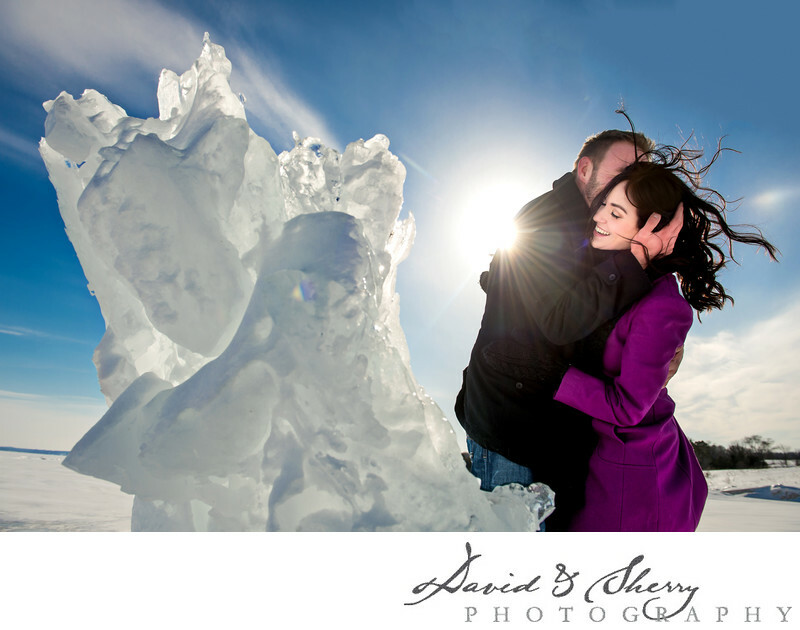 The light is then reflecting off the ice face giving a beautiful glow to the couple's faces. I love how the look of the ice, the large winter coats and the love in the couple's face has come together to create a truly unique engagement photo. We love exploring the winter in Canada and would be happy to do so for you too.